Hurricane Harvey hit the Gulf and caused flooding for many in the South. Image courtesy of NASA. With the Atlantic Basin hurricane season barely half over and a number of hurricane records in the books, many are asking if there is a relationship between powerful hurricanes Harvey, Irma, and Maria — and global warming. Some climatologists are answering yes, but the evidence is not conclusive. This year’s hurricane activity is a random fluctuation — a coincidence. The oceans have warmed to a point at which hurricane activity will be substantially enhanced. Feedback effects could reverse or accelerate any trend. Decoded Science will not take a definitive position on this matter until there are more data. However, we lean towards the view that Harvey, Irma, and Maria were not a coincidence. When Hurricane Harvey hit Texas, it was the first category four storm to make landfall in the United States in over ten years. 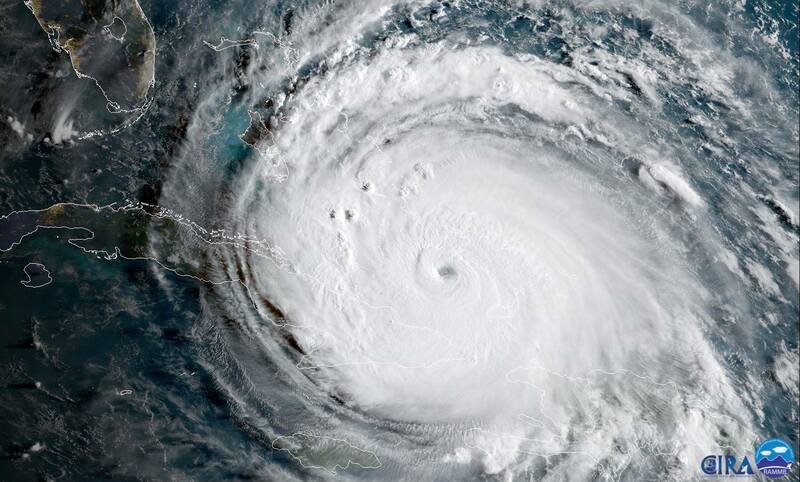 When Hurricane Irma struck Florida, it was the first time that two category four storms made landfall in the US in one month — ever in recorded history. So there must be something out of the ordinary in the tropics this year. La Niña conditions in the eastern Pacific and warm water across the Atlantic persist into mid-September. Graphic courtesy of NOAA. Since the spring, Decoded Science has been noting that the water temperatures across the Atlantic Ocean have been well above normal. Hurricanes thrive on water warmer than 26° C (79° F), and in August and early September the water temperature from the African Coast to the Antilles, and in the Caribbean Sea and Gulf of Mexico, exceeded this threshold, often by a substantial margin. The conditions that led to Harvey and Irma have persisted into September. And guess what? Here comes Maria, which just crossed Dominica in the Lesser Antilles and is headed towards Puerto Rico with 155 mile-per-hour winds. The peak of hurricane activity occurs with the peak of water temperatures — in early to mid-September. Oceans, since they disperse heat (and cold), respond more slowly than land surfaces to the change of season. Hurricane season extends through November, and there is often a secondary peak of activity in October, as tropical systems use dying cold fronts in the Gulf of Mexico and western Atlantic as springboards to intensification. In a low wind shear environment, Hurricane Irma was perfectly formed. Satellite photo courtesy of NASA. Water temperature is a limiting factor for hurricanes. But vertical wind shear is, also. Hurricanes extend upwards in the atmosphere to more than 30,000 feet. Any change of wind with height (vertical wind shear) will disrupt the flow of air into the hurricane near the surface, upwards near the center, and out at the top. This summer has been marked by very low vertical wind shear over most of the Atlantic Ocean. Many of the waves in the easterlies coming off Africa have found themselves in a favorable environment for development. Irma, in particular, developed in a path with no wind shear. As a result, the storm was symmetrical, and satellite photos showed strong outflow aloft. Irma briefly became the strongest hurricane ever observed in the Atlantic Ocean before causing havoc along its path. Years with La Niña conditions in the Pacific Ocean tend to have enhanced Atlantic Basin hurricane activity. The lower water temperatures reduce tropical convection, and the effect spills downstream into the Atlantic, damping the vertical shear. The latest forecast calls for an increasing chance of a serious La Niña this fall and winter. If those conditions carry on to next summer, the Atlantic hurricane season could be another blockbuster. The temperature percentile map for August shows new records scattered around the globe. Graphic courtesy of NOAA. The monthly data for August temperatures were released by NOAA on September 18, 2017. The unspectacular numbers — unspectacular by the standards of the El Niño years of 2016 and 2015 — should not lull the world into an overly skeptical view of global warming. The change in temperature since 1880 is nearly one degree Celsius — half the rise that meteorologists agree could set off catastrophic changes in the weather. Ask residents of southeast Texas, Saint Martin, and Key West what catastrophic means. Of the nine categories NOAA compiles, August was second, third, or fourth warmest of the last 138 years in eight. The ninth — southern hemisphere ocean — was sixth warmest. New warm records were set in the western tropical Pacific Ocean, much of the Arabian Peninsula, the western Indian Ocean, and scattered locations in South America, Africa, and the temperate parts of the Pacific Ocean. There were no new cold temperature records, and only the central US was well below normal. 2017 is second warmest for the first eight months of the year. Graphic courtesy of NOAA. Despite the La Niña conditions, 2017 is still second only to 2016 as warmest year on record. Most projections show 2017 finishing third, but in any event, the last three years are certain to be the three hottest since 1880. This Climate Change Checkup is published monthly, after the release of NOAA’s temperature analysis of the previous month — normally around mid-month. My Facebook friends have been waiting for your comments about these hurricanes! Thank you!